Featuring Jazzbo, the no-man band. Third time was the charm for us Guys' Nighters to check out the Mudbug Mondays special at Jazz -- our attempts to go in May and June had both suffered from last minute changes of venue. But we finally made it, and man, was it adequate. 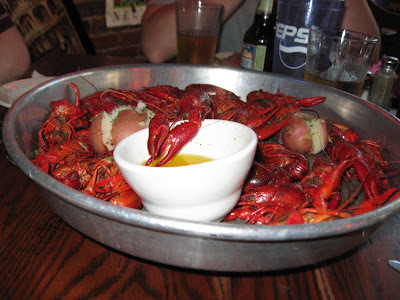 Mudbug Mondays is two pounds of crawfish and two domestic draft beers for $11.99. That sounded especially awesome considering that two beers alone will set you back around $8 to begin with. 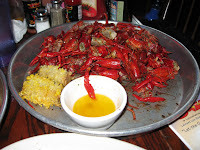 Of course, those two pounds of crawfish actually only nets out to roughly an 1/8 pound of food. It’s a lot of work for little meat, even if what you do get is pretty delicious. This was the first time I'd had crawfish in 15 years, so Robert had to show us how to twist the tail off to get to the good part. I also tried to break apart the claws to see if there was anything in there, and somehow managed to puncture my thumb on one of the spiky parts. Curse you, tiny lobster and your revenge from the grave. 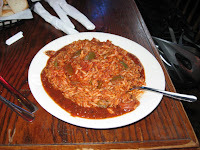 Dorsett decided to forgo the crawfish and got jambalaya, which I've had at Jazz before and found underwhelming. As one of the few Cajun places in Kansas City, and especially one that’s been in business forever, a staple like Jambalaya should blow you away here. I just don’t remember it tasting like anything special besides hot. Anyone can do hot. Ultimately Mudbug Mondays is a fine "one and done" experience. While enjoying the novelty of making a giant pile of crawfish corpses, you can pretend you’re a brutal dictator or medieval king or something. As Robert pointed out, the special is good for splitting if you’re going to get something else more substantial to share. We totally should've gotten the Voodoo Wings. We were bummed to find out that Jazzbo, the one-man band who usually plays on Mondays, had this week off for whatever reason. Maybe that would have really put the polish on Jazz tonight. Because nothing completes a mudbug slaughter better than a guy who looks like Santa Claus singlehandedly kicking out the Dixieland jams. I couldn’t wait to check it out. Besides the fact that Booche’s was ranked by USA Today as one of the top ten burgers in America, our itinerary called for us to get there at about 10:30 a.m., which meant we had a decent excuse for morning beers. Not that it takes much of an excuse. Arriving right on schedule, we sat down and ordered a couple of Michelob Lights, one of the only two beers that Booche’s has on tap. For the record, the other one is Boulevard Wheat. Since it was just us and the regulars, the wait wasn't going to be a problem, which was good because we needed a minute to look at the big menu mounted up on the wall -- although that was a monster tip-off there were rookies in the building. The only way we could’ve been more conspicuous is if we’d worn KU shirts. Kelly and I each ordered a hamburger ($2.75, tax included) and a cheeseburger ($3), both with everything -- ketchup, mustard, pickles and onions. Indeed, when the server brought them over, they were on tiny squares of wax paper. 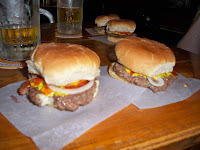 Bigger than a slider but smaller than your usual full-size burger, the burgers at Booche’s are totally scrumptious. They’ve got a taste all their own, something I’ve heard attributed to the flavoring that’s built up on the grill over the years. Just the right amount of greasy, too. One burger is a snack. Two is a meal. I get the feeling that after a few beers I’d be ordering them by the half-dozen. It may be all for the better that I didn’t go to Mizzou. As for Booche’s itself -- it’s awesome. To the left when you walk in, there's a nice long wooden bar with floor-mounted stools, while beyond the seating area the majority of the place is taken up by pool tables, snooker tables and a billiards table. Makes me want to watch "The Hustler" with Paul Newman again. 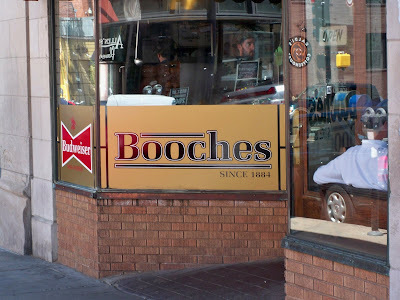 Dating back to 1898, there's some serious history going on at Booche's. Go read the story of the perpetually reserved table called X Land. I love a bar that’s chock full of tradition. On another note, I think I’m going to have to learn how to play snooker.